Research shows that small changes to environments can make a big impact on a child’s learning. Need some ideas to create a more engaging early learning environment? 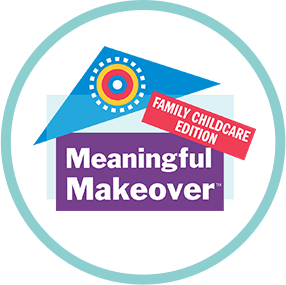 Meaningful Makeover is a web series created and produced by Gail Joseph, PhD, founding director of Cultivate Learning at the University of Washington. This series for educators and early learning providers offers tips, visuals, and inexpensive solutions that transform environments to promote learning opportunities, greater accessibility, and more engagement. Each episode highlights simple improvements that are easy to make. Watch our educational environment experts as they team up with providers to show the secrets and science behind the most impactful early learning spaces. DeEtta Simmons is Senior Director of Cultivate Learning at the University of Washington (UW). She leads the data collection process for the Washington state Early Achievers Quality Rating and Improvement System (QRIS). Before joining the Cultivate Learning team, DeEtta served children and families in rural Alaska, rural Hawaii, and Washington State in a variety of roles including lead teacher, program director, and Family Childcare provider.